Self Healing Colitis and Crohn’s: The complete wholistic guide to healing the gut and staying well was created by Dr. David Klein, a nutrition counselor with a PhD in natural health and healing. Klein says that all bowel diseases, including colitis, Crohn’s, diverticulitis, and irritable bowel syndrome can be healed completely despite contrary opinions. He explains that the symptoms of bowel diseases are actually a sign that the body is trying to heal itself but this cannot occur until toxic diet and lifestyle factors are replaced with healthy ones. The author had severe ulcerative colitis for eight years, healed himself on this plan and has remained healthy for over 25 years. He claims a 99% success rate within two to eight weeks with his clients and others who follow his healing plan, without the need for any medication. Klein advocates the Natural Hygiene System, which is described as being the science and fine art of natural healing and healthful living. According to natural hygiene philosophy the body knows how to heal itself and all that is required is that we simply rest, avoid toxins and eat our natural diet. Self Healing Colitis and Crohn’s claims that we are biologically adapted to eat a vegan diet and that this way of eating allows the bowel to remove toxins naturally and heal rapidly. During the healing stage the recommended diet is highly restrictive and is basically limited to juices, smoothies, fruit and certain steamed vegetables. Many other foods are to be avoided because they cause irritation to the bowel. These include spices, salt, meat, dairy, beans, soy and grains. Caffeine should be eliminated because it depletes the healing energy of the body. All fatty foods are to be discontinued during the healing phase. After the initial healing phase the diet can be expanded slightly to include certain sources of fat such as avocado, olives, durian, coconut, nuts and seeds, but a fairly restricted vegan diet must be followed for at least the first six to twelve months. Banana, papaya, grapes, pear, melon, mango, peeled apples, cherimoya, plums, raisins, dates, steamed vegetables (zucchini, broccoli, carrots, squash, sweet potato), green smoothies, fresh fruit and vegetable juices. Self Healing Colitis and Crohn’s says that during the healing phase when symptoms are present, complete rest is recommended. After this readers are advised to ‘stay fit and limber with appropriate exercise and stretching’. Walking, jogging, yoga and bodybuilding are recommended. 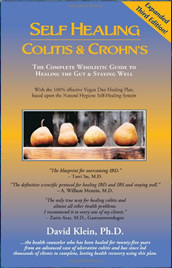 Self Healing Colitis and Crohn’s: The complete holistic guide to healing the gut and staying well retails at $23.95. Many sufferers of bowel disease have achieved lasting success on this program. The author is a qualified health professional and has personal experience of severe bowel disease. May also assist with the management of heart disease. Very restrictive and eliminates many foods including grains, legumes, meat, fish and dairy products. Must be followed exactly for reliable results. Will be very difficult to eat out and in social situations. The first phase diet appears to be nutritionally deficient. Vegan diets can be deficient in many important nutrients, especially if not carefully planned. Much of the information in this book has been taken directly from the writings of T.C Fry and Dr. Herbert Shelton, who were natural hygiene educators. Many sufferers of bowel disease have reported relief from their symptoms when following Self Healing Colitis and Crohn’s Diet. However, due to its highly restrictive nature it is recommended only for dieters who are highly motivated and preferably under the supervision of a qualified healthcare professional. Su, T., & Menzin, A. W. The Complete Wholistic Guide to Healing the Gut & Staying Well. Will this diet help with celiac disease? ** The Vegan Healing Diet Plan offers superior nutrition. People heal on it and their blood tests attest to the nutritional sufficiency of the diet. ** That is true. Eating otherwise perpetuates the illness. ** That is true only if one believes it’s difficult. It’s easy to be healthy and feel great. Following the unhealthy heard does not serve us. ** Blood tests and healing results confirm that it is not. ** Yes. The Vegan Healing Diet Plan offers superior nutritional and healing benefits. ** That is a good thing. They were masters of teaching health science and guiding millions to health. We should be grateful for them and all teachers whose work serves beneficial purposes.